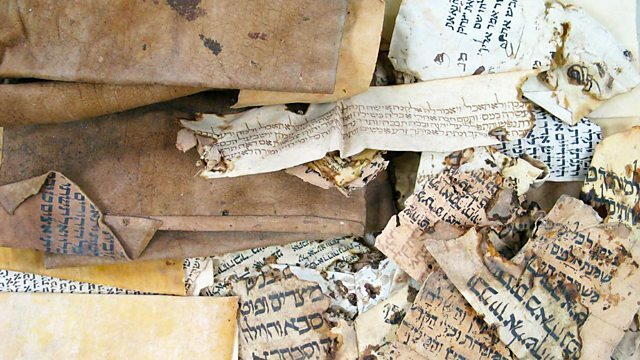 Dr Esther-Miriam Wagner reveals how an eccentric scholar and two Scottish twins braved a legendary curse to uncover the Genizah, medieval manuscripts in a Cairo synagogue. The Cairo Genizah is a treasure trove of manuscripts from the Ben Ezra synagogue in Old Cairo that portrays over 800 years of community life. Rediscovered in the 19th century, this vast communal paper-bin contained hundreds upon thousands of scraps of rag-paper and parchment. It's an unedited archive of prayers, letters, poems, magical spells, alchemical recipes, children's exercise books, divorce deeds and pre-nuptial agreements that paints a lively and intimate picture of daily medieval life in Egypt and the Eastern Mediterranean. In this first essay, Dr Esther-Miriam Wagner of the Genizah Research Unit tells the story of the discovery of the Genizah inside the ancient and crumbling synagogue of Al-Fustat, a suburb of modern day Cairo. Featuring a legendary curse, a pair of intrepid Scottish twins, an eccentric scholar and one very generous rabbi. Produced by Michele Banal and Miranda Hinkley. First broadcast in May 2013.